Acrovyn Hydroclad is a hygienic and impact resistant wall covering, ideal for interiors where the highest possible standards of hygiene must be maintained. Hygiene is paramount in environments such as surgical & medical facilities, laboratories, pharmaceutical facilities and food processing / preparation areas. Hydroclad is impregnated, throughout the sheet composition, with an anti-bacterial additive. Hydroclad also forms a physical barrier that protects walls against impact damage, an important step towards maintaining hygiene since cracked, damaged walls can form breeding grounds for bacteria and fungi. Hydroclad can be cut to custom shapes & sizes. Sheets can be pre-cut to project-specific sizes, or the material can be cut on site using simple tools. Acrovyn Hydroclad is available in 6 standard colours: Snow White, French Cream, Grey Could, Dove, Dusty Jade & Alpine Blue. Acrovyn Hydroclad is a ‘through coloured’ product. Acrovyn Hydroclad is impregnated with an anti-bacterial additive throughout the sheet composition. The smooth surface texture makes the sheets very easy to clean, and removes the risks associated with cracked surfaces that can turn into breeding grounds for bacteria, germs or fungi. 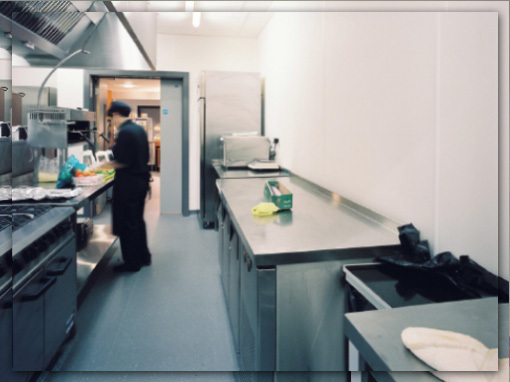 The impervious and non-porous surface makes Hydroclad resistant to chemicals, acids, alkalis and grease. These elements help in the fight against MRSA, E.Coli and other superbugs. Hydroclad is supplied with a plastic film to the face side, which is left in place until the room is ready to use. Acrovyn Hydroclad can be formed on site to create channels, angles, internal or external corners. Formed sections can also be supplied to order if required. Hydroclad sheets are suitable for thermoforming. Mastic Joints: Colour matched to all Acrovyn Hydroclad colours, CS Mastic ensures easy and fast installation. Hot Welded Joints: Welded joints can be achieved on site. Welding rods come in all standard Acrovyn Hydroclad Colours. Bullnose Edge: Hydroclad can be supplied with an optional bullnose edge. Trims: Edge trims are available in in all Acrovyn Hydroclad colours. Can be thermoformed for corners & reveals etc.